During December 2004, a salvage excavation was conducted in three dolmens north of Qibbuz Shamir (Permit No. A-4293; map ref. NIG 26175/78625; OIG 21175/28625), prior to the construction of a new neighborhood. The excavation, undertaken on behalf of the Israel Antiquities Authority and underwritten by Qibbuz Shamir, was directed by O. Zingboym, with the assistance of Y. Ya‘aqoby (administration), V. Essman and V. Pirsky (surveying), H. Tahan (pottery drawing), N. Getzov (professional guidance) and M. Kagan, R. Bar-Nur and Y. Ben-Ephraim (members of Qibbuz Shamir). The dolmens belong to a large dolmen field that extends across a rocky basalt area along the lower part of the Golan Heights. The area had been surveyed in the past (M. Kagen 1962. Survey of Dolmens in the Fields of Kibbutz Shamir and the Korazim Region. 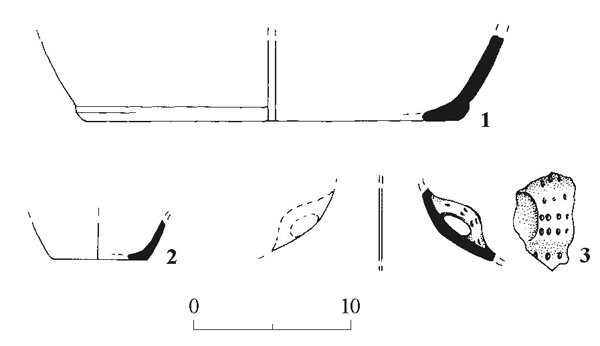 Me-Tikufat HaEven 3:33–39 [Hebrew]) and several dolmens were excavated (D. Bahat 1973. The Dolmen Field at Kibbutz Shamir. Eretz Israel 11:58–63 [Hebrew]). The three dolmens include burial cells that were, in all likelihood, originally covered with stone slabs which were removed when the contents of the cell were plundered. They were surrounded by three to four stone circles and the burial cells were not uniformly aligned. Dolmen 1 (Fig. 1). This is the largest of the three. 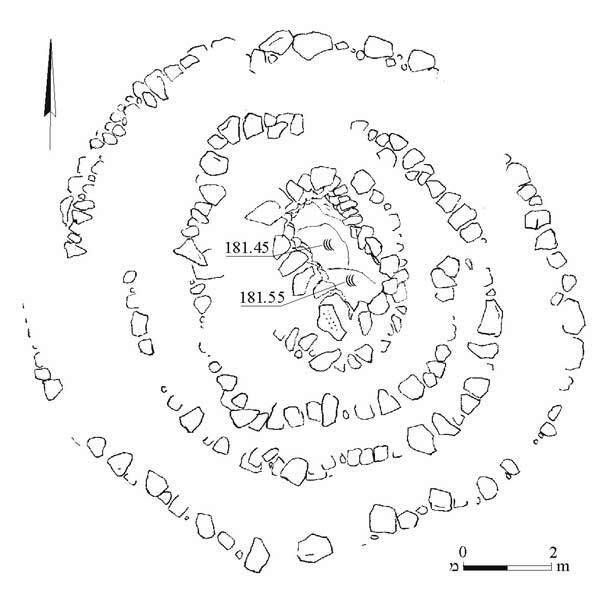 The elliptical burial cell (0.8 × 2.6 m), oriented northwest-southeast, was built of small and medium fieldstones that were preserved to maximum three courses high (0.8–0.9 m). 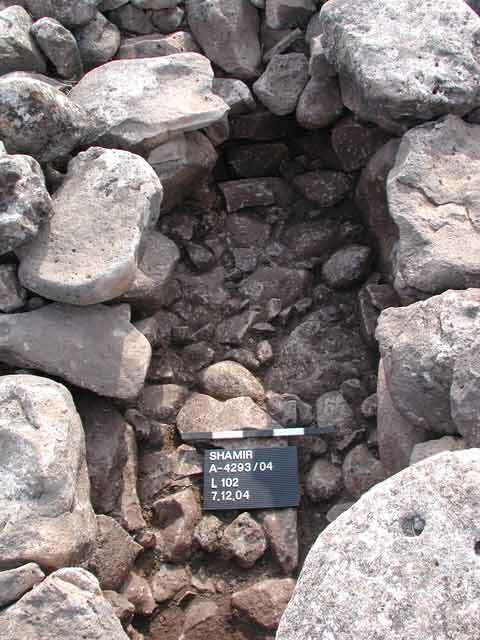 Fragments of pottery vessels that dated to the Intermediate Bronze Age (2300–2000 BCE) were lying on the floor of the cell, which consisted of small stones that were placed to level the bedrock surface. Four circles of fieldstones (max. diameter 12 m) were built around the cell. A stone game board (0.35 × 0.55 m) was located on the edge of the cell; it had seven pairs of hewn semicircular depressions and three single ones. Pottery vessels (Rashaya el-Fukhar ware) that dated to the nineteenth century CE were collected around the cell. It seems that this dolmen was erected in the Intermediate Bronze Age. Dolmen 2 (Fig. 2). 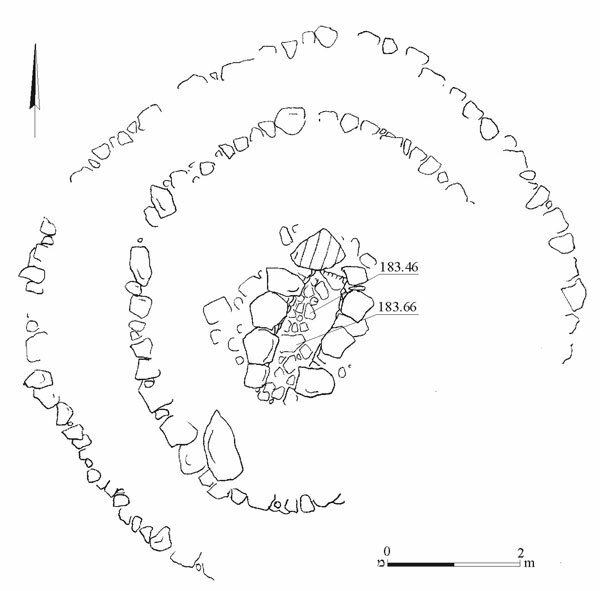 The elliptical burial cell (0.7–0.9 × 2.0 m), aligned north-northeast–south-southwest, was built of medium fieldstones and preserved to maximum two courses high (0.7–0.8 m). The floor of the cell, composed of small stones (Fig. 3), was overlain with fragments of pottery vessels from the Intermediate Bronze Age, including kraters (Fig. 4:1, 2) and a handle (Fig. 4:3). Another floor, c. 0.2 m below this floor, consisted of small stones that were placed to level bedrock surface; no ceramic finds were discovered between these stones or below them. 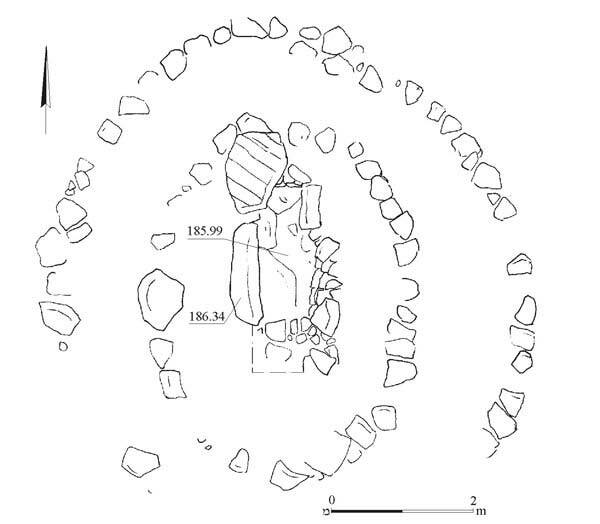 Two circles of fieldstones (max. diam. c. 8.5 m) were built around the burial cell. This dolmen was probably erected in the Intermediate Bronze Age as well. Dolmen 3 (Fig. 5). The rectangular burial cell (0.8 × 2.4 m), oriented north–south, was built of upright stones slabs, only two of which remained in situ; the rest were removed when the cell was plundered. Non-diagnostic potsherds, as well as fragments of pottery vessels from the nineteenth century CE, were gathered on bedrock within the cell, which was leveled with small stones. Two circles of fieldstones (max. diam. 7 m) surrounded the cell. 3. Dolmen 2, the burial cell, looking south.